Suppose you just purchased a new washing machine for your home. You are excited about all the new features and the many hours it will save you in your kitchen, and you are reading the instructions on how to make it do the best job for you. You discover a little sign that says, "WARNING! For the best and most efficient operation, do thus and so." What would happen if you suddenly thought, "I can't keep this in my home; it may fail me!" Just for a moment you took your eyes off of the benefits and enlarge on the word of caution and immediately all the benefits diminished in your mind! What God has promised is the same thing for the individual who recognizes what has been done for him and what God wants to do. God's promises and his benefits are all spelled out for him and the equipment is superior. We are sold on how good God is and how his interest in us is told in all of his good promises, not one word of which has he ever failed to perform (unlike the internet plan I continue to pay for). His guarantee is unlimited! 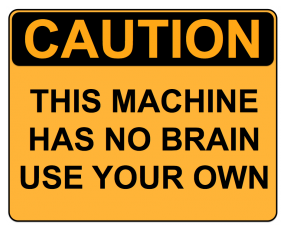 But there is still a warning sign, and it is there to make it work for you! A red light flashes at a crossing when it's time for the cars to start coming, to prevent us from getting killed! (unfortunately they don't work so well in Nigeria though) but you get my point. A fire engine sounds a siren to warn us of its approach! A fever warns us of sickness and infection. All of these signals are good, and so are God's warning signs. They are just as effective to keep us from getting killed (spiritually) God loves us so much he has posted warning just for our protection! WARNING! "Be careful. If you are thinking, 'Oh, I would never behave like that person' - let this be a warning to you. For you too may fall into sin. But remember this - the wrong desires that come into your life aren't anything new and different. Many others have faced exactly the same problems before you. And no temptation is irresistible. You can trust God to keep the temptation from becoming so strong that you can't stand up against it, for he has promised this and will do what he says. He will show you how to escape temptation's power so that you can bear up patiently against it. So, dear friends it could me money or your career or a boyfriend that has taken the place of God in your heart, carefully avoid idol-worship of every kind" (1 Corinthians 10:12-24). WARNING: "The backslider in heart will be filled with his own ways;" (Proverbs 14:14). When you begin drifting back, long before you get totally away from God, you are interested only in those things that pertain to you, not the things of God. This is a warning sign. WARNING! "What will we say then? Will we continue in sin, that grace may abound?" (Romans 6:1). The grace of God is a beautiful covering, but it is not a license to sin. God's grace is something we did not earn, something we cannot buy. A person who thinks they can do what they please is rebelling against God! WARNING! "... Receive not the grace of God in vain" (2 Corinthians 6:1). God's grace is a gift and should not be received in vain. Paul tells about this in connection with what God did in providing his covering, and he gave us this warning: "For God took the sinless Christ and poured into him our sins. Then, in exchange, he poured God's goodness into us! As God's partners we beg you not to toss aside this marvelous message of God's great kindness." God did this for you and what a beautiful word of assurance he is giving, but he warned us not to toss it aside for worldly pleasures. "For God says, 'Your cry came to me at a favorable time, when the doors of welcome were wide open. I helped you on a day when salvation was being offered.' Right now God is ready to welcome you. Today he is ready to save you."! WARNING: Beware of a loss of a sense of the importance of spiritual things! There are many, many believers on the road of lethargy. Lethargy is a sense of lack of importance; a drowsy dullness to God; a lack of spiritual energy; sluggish in activity. Lethargy speaks forth from our inner being when we say, "It's easier to stay home. It's hard to generate excitement and zeal for the things of God. I have a few other things I want to do today, so I just won't go to church!" God's remedy: "Let us not neglect our church meetings, as some people do, but encourage and warn each other, especially now that the day of his coming back again is drawing near" (Hebrews 10:25 TLB). Remember, if you feel numb and cold inside and it's a weight and a burden for you to think, "Here's another weekend and I have to go to church. What a chore!" Law-abiding people are not worried if they get a call from the Economic and Financial Crimes Commission In fact, if they got a call from EFCC they might think that it was for recruitment They don't need to be worried, because they have been obeying the law. That is exactly the way God wants you to feel about him!